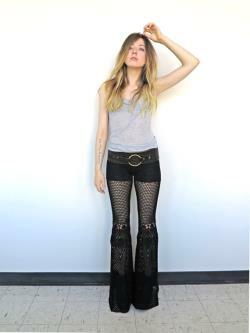 These romantic bell bottoms feature a super wide lacy leg that swing when you walk. Fitted like leggings, they truly flatter all shapes and sizes. The brief section is double knitted and has full coverage. The lower leg is crocheted in a sheer mesh pattern. Secure waistband construction with 1.5 hidden elastic. Content: 100% cotton crochet thread. Rise: 8 for size s.
Inseam: 35 measure from crotch to hem while wearing shoes. Length can be adjusted upon request. Hem: 20" wide / 40" circumference. Care: handwash / dry flat. 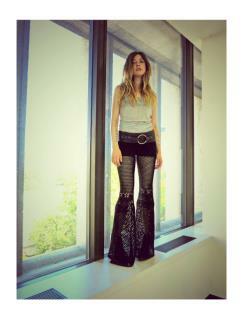 Adjustments: pants may be sent back at any time for free length alterations. Please see image of size chart. For most accurate fit, use your hip measurement in choosing your size. Model devyn is wearing size small with 35.5 hips.